Two people have died and 19 others were taken to hospital after being overcome while in a sauna-like room at a spiritual retreat in Arizona. 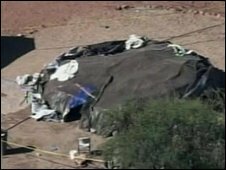 Police said 64 people were inside a so-called "sweat lodge" at the Angel Valley resort for up to two hours before many of them became ill. The pair who died were a middle-aged man and woman, police said. Investigators are speaking to staff and guests and carrying out toxicity tests in an effort to find out what happened. The 70-acre retreat near the town of Sedona, about 115 miles (185km) north of Phoenix, offers holistic treatments and spiritual retreats in a natural setting, according to its website. Reports said some of the sweat lodge participants had paid up to $9,000 (£5,700) for their stay at the retreat. The resort offers a wide range of treatments from massage to colon cleansing, healing carried out by harnessing the consciousness of a dolphin, or "vortex experiences", in which participants "experience our human energy system interacting with the earth". Local TV images showed the "sweat lodge", or sweatbox, to be a dome-shaped frame covered by tarpaulins and blankets. During the sweat lodge experience, the tent was gradually filled with steam generated by pouring water on to fire-heated rocks brought inside the dome. The sweat lodge has traditionally been used as a ceremonial sauna in rituals practised by some Native American cultures. The intense experience can be dangerous to people with pre-existing medical conditions or if the sweat lodge is poorly constructed or badly managed. The actual cause of the two deaths at Angel Valley remains extremely unclear, police said on Friday. Homicide detectives were among investigators combing the site, with tests being carried on air inside the dome and searches of buildings at the retreat, Yavapai County sheriff's spokesman Dwight D'Evelyn said. Police are also investigating whether any of those taken ill had pre-existing medical conditions or were fasting, he said. "There are a lot of issues that may have led up to these injuries and deaths," Mr D'Evelyn told the Associated Press. "It's not something you would normally see at one of the resorts there, and it is unfortunate regardless of the cause." Twenty-one people were taken by ambulance and helicopter to hospital on Thursday night. Two were listed as being in a critical condition on Friday. Half a dozen others were said to have been discharged after making a quick recovery. Verde Valley Fire District Chief Jerry Doerksen told AP that people had begun to emerge after about two hours in the sweatbox, feeling light-headed and weak. He told AP he had sent a hazardous materials team into the sweat lodge to test for substances such as carbon monoxide and other contaminants, but that nothing out of the ordinary had been found so far.